Pineapple Jam Roll/ Pineapple Swiss Roll/ Cake roll is the best tropical treat to beat the summer heat. 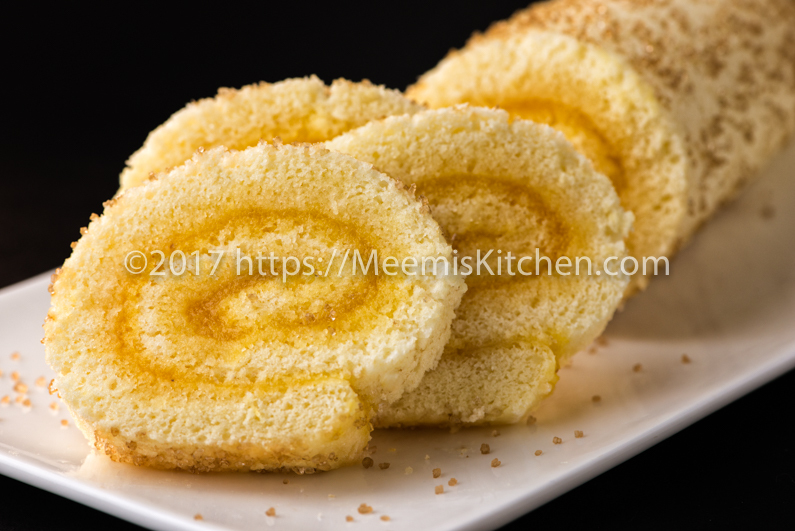 Refreshing and delightful Pineapple Jam Roll is a perfect blend of soft Sponge cake and golden Pineapple jam, lip-smacking goodness spiraled to fineness. The soft yellow bites are addictive and a pleasure beyond imagination! I have fond memories of ‘Kunjus Jam roll ‘- very famous, especially in the Kanjirappally region in Kerala: origin place of Kunju’s Pineapple Jam roll. The sticky golden delight was indeed addictive! 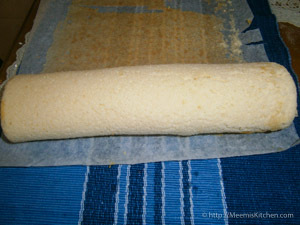 I always thought Jam Roll/ Swiss roll was a complicated process until I tried at home. Although it sounds complex, it is very easy to prepare and will be over in minutes. This gorgeous Pineapple Swiss Roll tastes amazingly refreshing with homemade Pineapple Jam (please do not get intimidated, as it is quite easy). 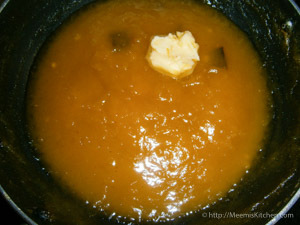 You may use store brought Jam, but homemade Pineapple Jam tastes awesome and provides the gusto.! I make surplus jam and refrigerate it, for later use. It can be used for preparing Pineapple Pudding, a classic dessert with this tropical fruit. Swiss Rolls are a huge hit with kids, and you can experiment with Apricot jam, strawberry jam, cream filling etc. You may also like my Black Currant cupcakes, Melting Moments cookies, Butter cake, Hot milk Sponge cake, Easy Sponge cake and other fruit cakes, tea cakes, exotic cakes, doughnuts , Eggless Chocolate Brownies and my sweet dessert collections like Tender Coconut pudding, Gulab Jamuns and Puddings/ desserts. For this Pineapple Jam roll recipe, I used a 12” x 10” tin, and used extra measures to get that perfect pinwheel. If you have a smaller tin, take 2/3 measure. Baking provides immense pleasure to me and it is simply rewarding. 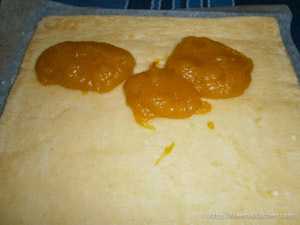 These Pineapple Jam rolls does not have too much butter (for guilt free indulgence) and is not overly sweet or sticky. You can adjust the measure of jam to achieve the correct sweetness that suits you. Without further ado, here is the recipe for wonderful Pineapple Jam rolls / Swiss Rolls. Let me warn you in advance, once you have the first bite, it is impossible to stop! Cinnamon stick : 1 no. Clean and cut the pineapple, carefully removing the brown prickly spots, without losing much flesh. Remove the middle part and cut into small pieces. Grind without water to make grainy Pineapple pulp. 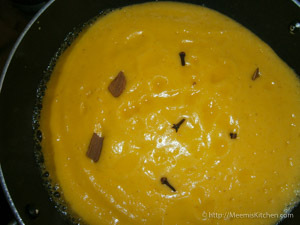 Pour in a pan and add cloves and cardamom and boil, stirring occasionally, to make it dry. Add sugar (adjust measure as per the sweetness of the pineapple), stir to combine well and continue heating it, till you get a smooth jam. Add 1 tbsp butter to loosen it. Keep aside for cooling after removing the cloves and cinnamon pieces. 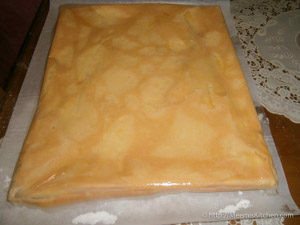 Grease the 12” x 10” tin with butter and line with baking paper. Grease and dust with flour. Keep aside. Pre-heat the oven to 200o c. Measure all ingredients. Sieve the flour (80 gms) and baking powder to combine. 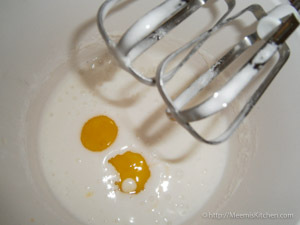 Separate the egg yolk and white (3 eggs). 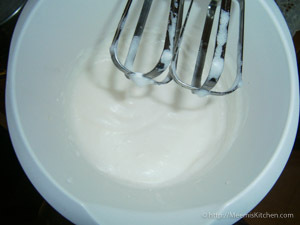 In a dry bowl, collect the egg whites and beat till you get soft white foam. Slowly add powdered sugar (90 gms) little by little and beat well. Now add the Egg yolks one by one and beat till fluffy. Add the vanilla Essence. With a spatula, gently fold in the flour, little by little and lastly add the melted butter. 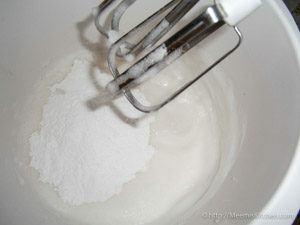 The batter should be of flowing consistency. Pour it into the prepared cake tin and spread evenly. Immediately bake at 200o c for 8 minutes or till slightly brown. 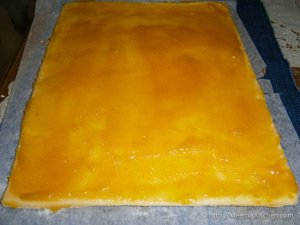 Take another Baking paper (butter Paper), sprinkle some powdered sugar / Brown sugar on it. 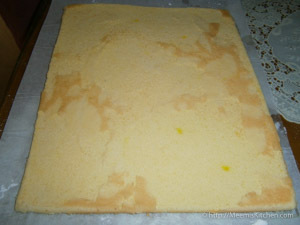 Invert the cake to this paper and remove the parchment paper on the top. Immediately roll the cake when it is still warm. 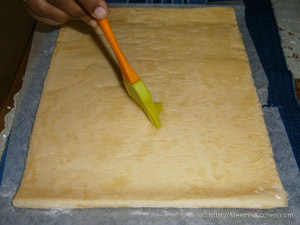 This is to make the cake more pliable and easy to roll without any cracks. Leave it for two minutes, unroll and spread the sugar syrup first. 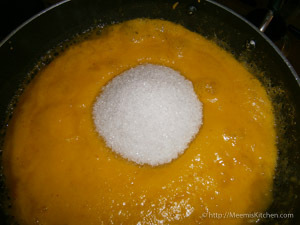 (To make sugar syrup, boil ¼ cup water with 2 tbsp sugar till you get a thick syrup) Take the jam and spread it evenly on top of the cake and roll gently, starting from one end, gently separating from the parchment/ butter paper to get a perfect spiral. Keep it covered in the parchment paper and chill for half an hour.Sprinkle with Brown sugar and cut into small golden spirals. Enjoy the delectable golden Pineapple jam roll. God Bless! Make sure you have the cake tin greased, lined and dusted before you start preparing batter. 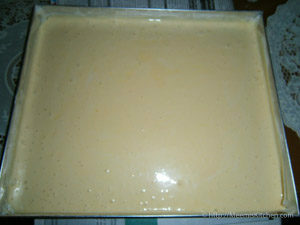 I used 12” x 10” cake tray/ tin, if your cake tray is smaller, use only 2/3 measure; Baking Powder (1/2 tsp) . Use only rectangular shaped tins. Take exact measurements of flour and sugar. Beat the egg white till it is stiff. Beat on high speed for three minutes. Always use fresh eggs; and make sure that you use a dry bowl for beating egg whites. When you make pineapple jam, adjust the sugar measure as per the sweetness of the Pineapple. You can make more quantity of pineapple jam and store it in refrigerator. Skip adding butter if you are using as pure Jam. Baking Powder and Maida should be sieved two times or more. 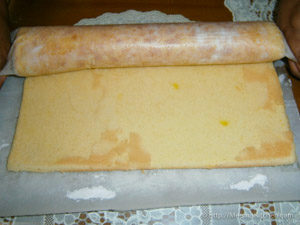 Roll the cake while it is warm to avoid cracks and easy rolling. 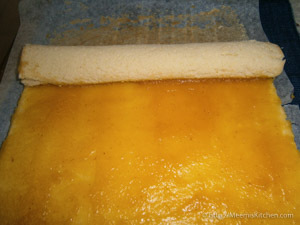 Please try this amazingly refreshing Pineapple Jam Roll / Pineapple Swiss Roll. Continue to encourage me by commenting below or by sharing to your friends using the links on the side. God Bless! !